Opens flat for “cash drawer” convenience. Removable six-compartment molded plastic tray with storage underneath. 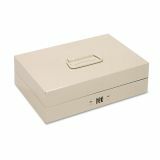 SteelMaster Heavy-Duty Steel Lay-Flat Cash Box w/6 Compartments, Combination Lock, Sand - Portable cash box with combination lock is ideal for petty cash, fundraising and small businesses. 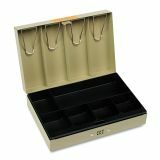 Unique design allows cash box to open flat for easy access to bill clips in the lid and six-compartment tray in the base. 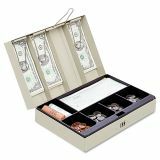 Four bill compartments with spring clips are built into lid to keep bills in place for faster transactions. 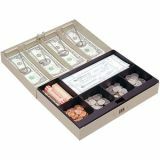 Molded six-compartment tray organizes coins, checks, large currency and receipts and can be removed to reveal a secret storage compartment. Heavy-duty steel construction includes a scratch-resistant and chip-resistant finish. 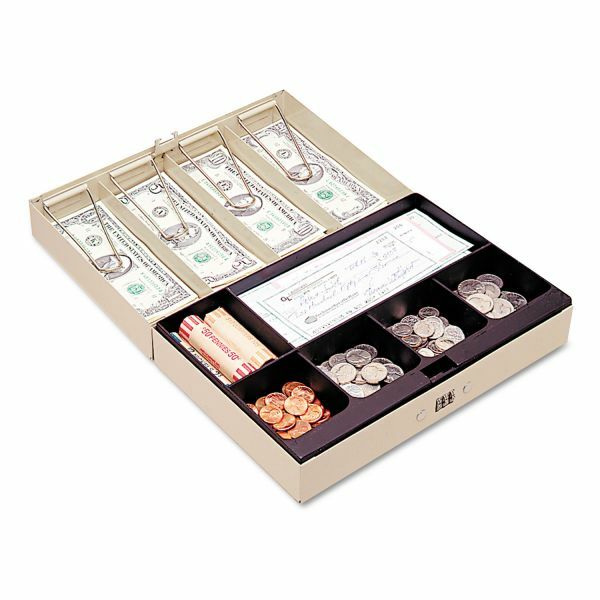 Cash box features a keyless combination lock.